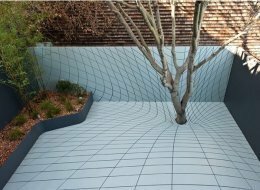 This backyard is perfectly flat. The lines create the illusion that the tree is being sucked into a hole. Read article. This page contains a single entry by Otto published on November 21, 2009 7:21 AM. Computer Chips in the Brain by Year 2020 was the previous entry in this blog. The Amazing Bubble Man is the next entry in this blog.